A Right to be Gay - Moses Must Stay! 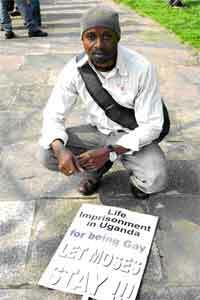 Moses Kayiza is a gay asylum seeker in the UK who fled Uganda in May 2004. 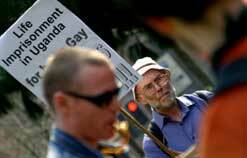 According to the law, religion and culture in Uganda, homosexuality is strongly criminalised. The official maximum penalty is life imprisonment. Yoweri Museveni, the President of Uganda, once proposed the arrest of all homosexuals - though he subsequently modified his position and called for a return to the good old days when "these few individuals were either ignored or speared and killed by their parents". Moses lived in secret for a number of years as a young gay man. In 2003 the pressure from Moses' family and tradition mounted and he succumbed to an arranged marriage. After 13 months of marriage and a period of separation, Moses' wife returned to their family home and found Moses with his long-term male partner. Moses' wife reported him to the police, and on the basis of evidence gathered, the police subsequently arrested Moses. As is not uncommon in Uganda, whilst in custody Moses was tortured and sexually abused for 7 days by the security forces until his escape. The Adjudicator refused Moses' asylum claim, making seemingly contradictory remarks; "If, as the appellant says, homosexuality is illegal and persecuted in Uganda I find it unlikely that on 4 nights in a police station police officers would indulge in it." He went on to say that "The objective material shows that homosexuality is still criminalised in Uganda. However it does appear that little if anything is actually done to enforce the law". The United Nations state that sexual violence is a strategic weapon of war, not just a random act. Moses' arrest and torture in prison is not unusual in Uganda. Since the President's comment in 1999, the Minister for Ethics and Integrity Miria Matembe has ordered the police to arrest and prosecute homosexuals, adding that she will fight gays until they are wiped out of the country. Amnesty International has documented cases of homosexuals being tortured in Uganda, and Moses' own medical evidence supports his own experience of torture. Moses is not in a position go back into the closet if he were forced to return to Uganda. He has previously been arrested and tortured, and the police continue to hold evidence of his homosexuality including a photo of him and his partner. Moses' wife's father used to be the official in charge of police matters at the Ministry of Justice, and was responsible for the original police involvement - he is likely to use his influence in the security forces again if Moses returns. Since coming to the UK Moses has settled in the Manchester area, and made many friends in the local gay community. He is an active volunteer with Manchester Refugee Action and the George House Trust, alongside pursuing his studies. The pressure of his asylum case and fear of being returned to Uganda, on top of the psychological pressure from his experiences of torture, lead to him being hospitalised under section 2 of the Mental Health Act. He was in hospital during the period when he could have lodged an appeal to tribunal. September 1999 president Yoweri Museveni instructed Ugandan police to lock up and charge homosexuals. In October 1999 five members of the newly formed organisation, Right Companion, were arrested and deported to so-called 'safe houses.' One of the activists was raped twice, all were beaten. June 2000, Ugandan police cover up the murder of a member of Lesgabix, a lesbian and gay grouping in Kampala. February 2005 - Mr Martin Amogor-Locain, Commissioner for Special Needs Education, Counselling and Guidance in the Education Ministry "The spread of homosexuality and lesbianism in secondary boarding schools is worrying the government. Due to spread of the pervert sexual behaviour the government is worried about "what might happen to youths in the country." Please help us to stop Moses being deported from the UK back to Uganda where he may face life imprisonment or worse. Please spend one minute and sign out petition at http://www.mosesmuststay.org.uk.